Showing results for tags 'utility'. I GUESS YOU GUYS ARE WAITING FOR A NEW RELEASE BUT I AM REALLY BUSY WITH OTHER THINGS AND LIFE AND THERE ARE LOTS OF ANNOYING BUGS WHICH HARD TO FIX. SO THANK YOU FOR YOUR PATIENCE. A alternative and advanced version of RenList listing utility. This is a server listing utility which takes data from GSA feeds from GSA Master Server hosted by CnCIRC and lists server for user. The differences between RenList and MasterList and the reasons of why you should prefer MasterList is specified below. If you using my lister, thank you so much. Please always use the latest version of this • MasterList is quicker than RenList for listing speed. • MasterList is simplier and more advanced than RenList. • Usage of MasterList is easier. The changes that planned and going to add: • Buddy system. Notices you when your buddy in a/any server. • Favorites system. Notices you when a event that you want happens. Example, when the map you want starts. • Some basic improvements for visual of UI. • Some other improvements for backend. Some help?? Look below! • Find "Theme" option from Menu>Options list to change your theme. • Change your nickname or your Renegade Installation directory from the related options on Menu>Options. • And be ready for other new features! 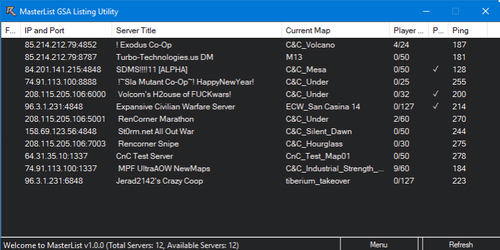 Please report bugs and suggestions to me on here or Discord ( The Unstoppable (TR)#1065 ) or find me from MPF Discord Server at http://multiplayerforums.com/discord Enjoy!